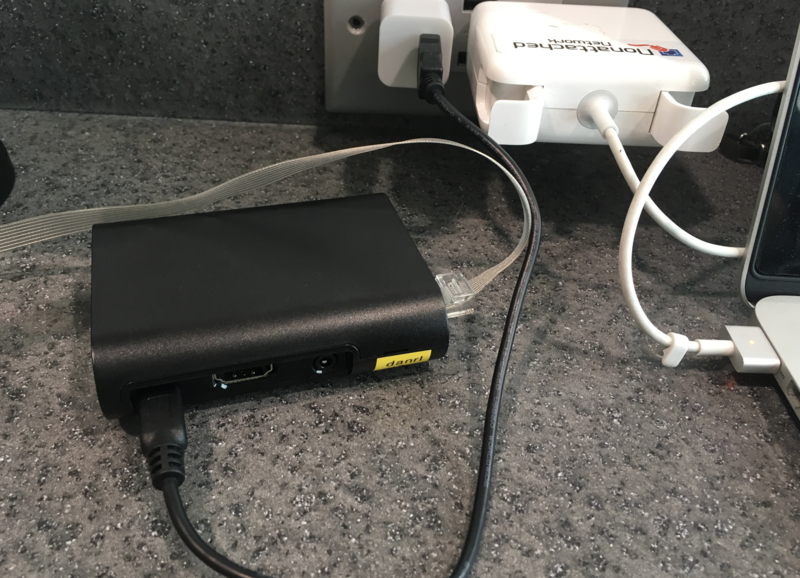 This article is about building a secure travel wifi router using a RaspberryPi and the Wireguard VPN protocol. 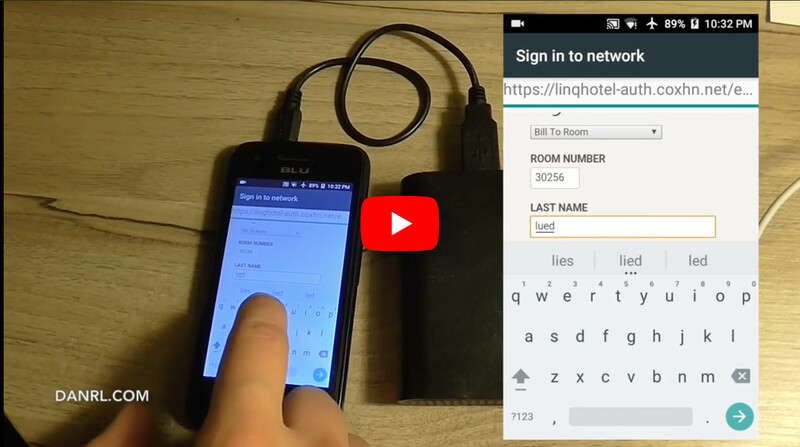 It is a long and technical article describes how I stopped worrying about untrusted and insecure wifis in hotel rooms and conference venues. I travel a lot and therefore often rely on wifi provided in aircrafts, hotels or conference venues. Unfortunately, the state of security of those uplinks is worrying, connections are often buggy and rarely encrypted. A WPA2-protected wifi with pre-shared key (PSK) does not provide individual security. Everyone knowing the password can easily eavesdrop on all the traffic, not just their own. Only few sites offer more secure wifi, e.g. facilitating WPA enterprise and individual accounts. Why don’t I just use a VPN on my devices then? Well, first I carry quite a few devices, and not all of them are capable of running a modern VPN. Secondly, some of them can not handle IPv6-only VPN connections. That’s a show stopper for me. Furthermore, many hotspots are protected by a captive portal that requires me to login to the portal on every device before I can establish a VPN tunnel. Given that I am allowed to connect more than one device at all. Even worse, some captive portals require re-authentication every 12 or 24 hours or whenever a devices re-enters the area of wifi coverage. The most important reason why I avoid using on-device VPN termination whenever possible is that devices can easily be tricked to circumvent the VPN connection for some traffic. The most harmless threat being DNS leakage, but more sophisticated attacks include fake proxy configuration, rogue routers and all sorts of MITM attacks on HTTPS and other protocols. I tried many different approaches to face the problem over the last couple of years. Provide a private, secure wifi for my devices. Private data passing the untrusted wifi must be encrypted. Do not leak any data from inside the secure wifi. Mitigate most common attacks by not trusting the untrusted wifi’s link layer at all. Provide a way to quickly (re-)authenticate on captive portals. Let’s go through the above network diagram from the bottom up. At first, we have the devices we want to securely connect to the Internet. That is, for example, a notebook, a phone and another random gadget. They join the private wifi provided by private router. The private router encrypts all traffic that is headed towards the Internet using a VPN. The encrypted traffic is then routed through the untrusted wifi (e.g. an open hotel wifi) via the access device. This can be a cheap smartphone or a pocket router. I strongly suggest using something with a screen and a browser, because the access device not only has to provide an attack-free link to the private router, but also needs to authenticate to all kinds of weird captive portals. Android 6.0 with automatic security patches is a good idea and has successfully been tested with this setup. For providing the uplink for the private router I recommend USB tethering. Not only does the USB cable charge the access device, it also provides enough freedom to place it somewhere where the untrusted wifi signal is strong. We gain a security benefit from using a dedicated access device for shielding the untrusted wifi’s link layer from the private router. Sadly, many untrusted wifis are legacy-IP only, in such environments we pay for the benefit with an additional layer of NAT. 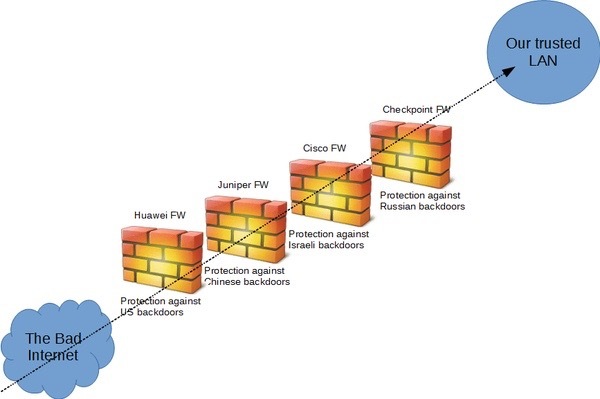 However, more firewalls are better they said, right? Back to topic: Once the encrypted traffic worked its way from the private router via the access device, through the untrusted wifi it finally reaches the Internet. Which, of course, we don’t trust either, although most of our packets from the private wifi will end up there eventually. Encrypted traffic finally hits the VPN server where it will be decrypted and routed properly (read: released into the wild, wild Internet). Too abstract? Here are two possible setups for clarification. 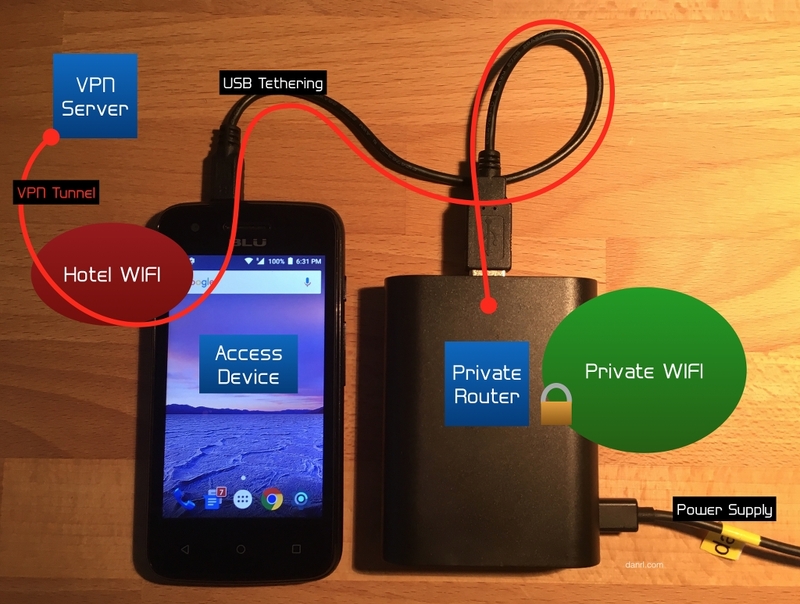 The photo above shows a mobile phones being used as the access device for the private router. Here I used a small OpenWRT router as access device for a wired, but untrusted network. I could have connected the private router directly to the wired network if it was a bit more trustworthy. and gives you access to the whole Internet in locations where they only have legacy IP and/or censorship. A small linux-capable computer with integrated or attached wifi hardware, preferably a RaspberryPi 3 or C.H.I.P. This will become the private router. A server, preferably a dual-stacked virtual instance running Debian Linux Jessie. This will become the VPN server. A spare Global Unicast /64 that is routed to the VPN server. We will use this prefix on the private wifi. A smartphone, preferably running a recent version of hardened Android. Beware of super-cheap devices, some of them perform terribly when running in tethering mode. You have been warned! No fear to compile a Linux kernel module. Scared? Don’t be, it’s not that hard, really! Endurance, as this is not a 10 minute project, but it’s worth it! For the in-tunnel addressing, basically a point-to-point connection, we use Unique Local Addresses (ULA). I strongly suggest generating an individual pseudo-random RFC4193 prefix out of fc00::/7. Use this fancy online tool from our friends at SixXS to generate yourself your very own prefix! I’ll be using fd12:3456:7890::/48 for the remainder of this article. Please replace those addresses accordingly. The private wifi uses a slice of your Global Unicast prefix, whatever this may be. I happen to have a /48 prefix, but heard from others that they got even bigger chunks from their registry. No worries, a single, routable /64 is sufficient! acts as a first line of defense for unwanted packets from the Internet. We start with a fresh install of Debian Linux Jessie, for example on a small VM in a datacenter. Then we configure network connectivity, backup service and basic filter ruleset to our personal preferences. You probably have your own deployment and configuration method and tools, so I refrain from bugging you with basic system administrator tasks and just trust your workflow. At this point you should have the machine ready to be accessed via SSH and know how to gain superuser privileges. Wireguard is a new, promising VPN protocol. After many years of working with OpenVPN, L2TP, IPsec and even SSH as VPN, working with Wireguard feels just awesome. It is simple, extremely reliable and it just works. WireGuard is an extremely simple yet fast and modern VPN that utilizes state-of-the-art cryptography. It aims to be faster, simpler, leaner, and more useful than IPSec, while avoiding the massive headache. It intends to be considerably more performant than OpenVPN. As Wireguard is an in-kernel VPN implementation, it is either already part of your favorite distribution or you have to build it from source. We are using Debian Jessie on the VPN server, which means we have to install a backported kernel and build the Wireguard kernel module and userspace tools. Now it’s time to grab a copy of the source and compile it. With modprobe wireguard we load the module into the running kernel. By adding a line reading wireguard to /etc/modules the system does this automatically after the next reboot. Head over to the Wireguard website and browse through the documentation to make yourself comfortable with the concept. 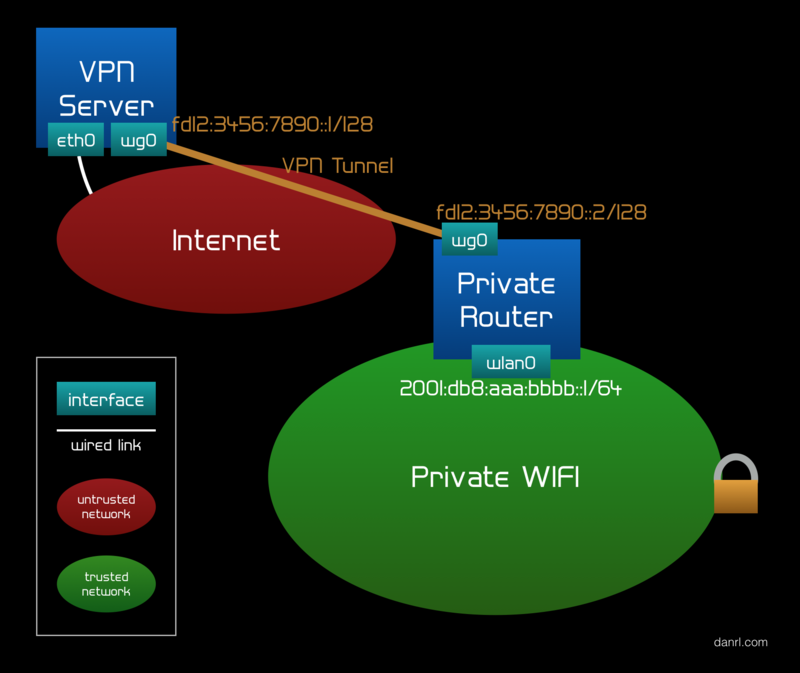 Wireguard is a crypto-routing, in-kernel, device-based VPN technology. If you have a hard time understanding what this means, consider giving the documentation another shot. It took me a while to grasp how nice and fancy the approach is compared to other VPN technologies. Especially, if one plans to establish mostly static routes, like we will in the upcoming sections. I assume we are all set and ready for our first Wireguard tunnel? Let’s do it! I usually suggest storing the key pair only on the same system on which it is used. Please transfer the private key securely to the private router later and remove it from the VPN server (e.g. use shred). This should leave us with two files for the server and another two files for the private router. They contain the VPN server’s private and public key. Make sure you don’t confuse these two! The tunnel won’t work if the private and public keys of the endpoints are not correctly distributed! UDP port 500 is commonly used for IPSec, which increases the chances that this port is not blocked in an maybe restricted wifi. What may be confusing when done the first time is the AllowedIPs directive. Let me go into detail here, as it is essential for secure crypto-routing that we filter for source addresses. 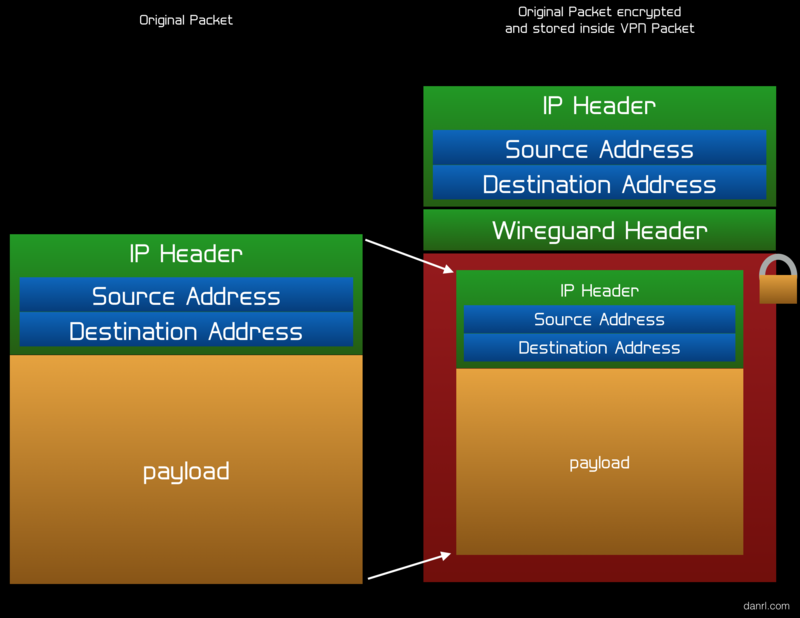 When a packet enters the tunnel, it gets encrypted and becomes the payload of a Wireguard packet, which itself is the payload of a UDP datagram which in turn is the payload of an IP packet. For the sake of simplicity, let’s ignore the UDP header for a moment, as it does not add any value to the discussion. So, we have our Wireguard packet coming in from another endpoint, and the payload is the original IP packet. Without AllowedIPs, we would decrypt the payload, thus get the original packet, and route it according to our routing table. How could we know the source address of the original packet wasn’t spoofed? Do we trust our endpoint that much? Probably not! This is why we put some restrictions on the original packet’s source address using AllowedIPs. Even if the encrypted packet authenticates and decrypts properly, we would not route it unless its payload (read: the original packet) came from within an allowed prefix. We can also explicitly allow IP forwarding on the new interface. This step may or may not be required, depending on your sysctl.conf settings. It is good style to remove the wg0 interface on shutdown. That may also prevent hard to debug errors in some cases. Remember to set appropriate file permission for all files containing private key data! From now on, the wg0 interface should come up right after the system boot. Why don’t you try it out now? That’s it for routing on the VPN server. The rest will be taken care of by the default and interface routes. Easy, wasn’t it? prevents DNS leaks to protect our privacy. 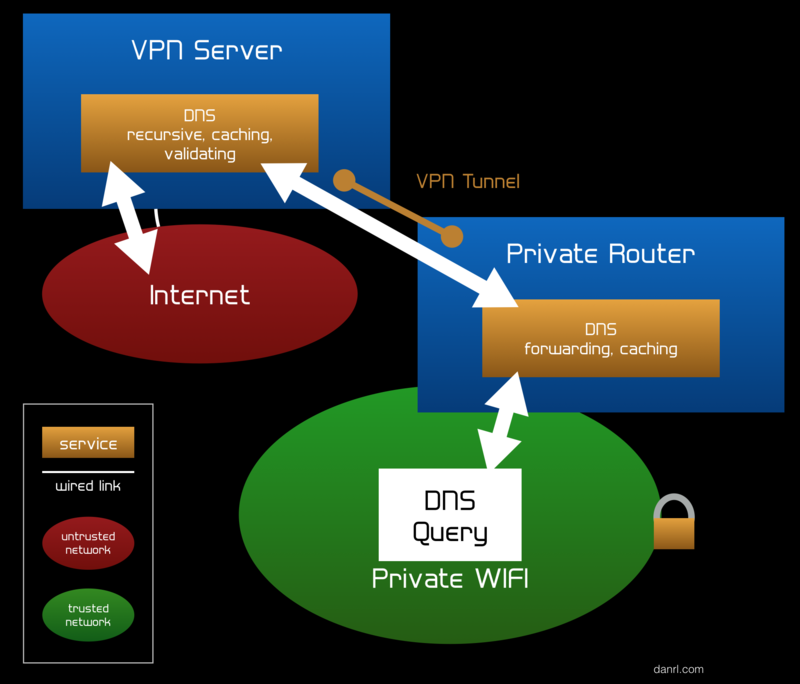 To have a fast response time, the DNS server should cache results from previous queries, serving them directly from the private router to the connected clients. The DNS server on the private router must not resolve recursively, as it can produce a lot of back and forth traffic. Bandwidth and latency may be suboptimal in the typical hotel wifi situation. Validating resource records can be done by using DNSSEC, but adds some extra data that needs to be fetched. This DNS setup uses two DNS servers, one on the private router and another one on the VPN server. It has the nice advantage that we can run the bandwidth-heavy, latency-critical and computing operations on the server, which is expected to be better connected and also more powerful than the private router. The on-server DNS instance takes care of resolving recursively, validating and some caching, the local DNS server on the private router just forwards queries and caches the responses. Since the connecting between these two DNS servers happens to be inside the tunnel, we consider the responses from the recursive server trusted (as in: not modified during transit, no need to run DNSSEC again). The tunnel also prevents DNS leakage. Let me say a few words regarding filtering first: Filter rules are constantly evolving as new attacks and threats appear or protocols develop. Proper filter rule management is therefore a must-have for all systems we are responsible for. Furthermore, filter rules are not pure science but are also highly influenced by what one considers best practice. I have seen many well-thought-through filter rule sets, but I rarely see two that are the same. This leads me to the conclusion that filtering is sometimes more art than science and everyone has personal preferences on how rules should be ordered or look like. I will assume that you set up your own basic filtering right after you installed the operating system and that you know best how you want to manage your rules. That said, we will only discuss rules here that are specific for the problem we are solving. You are expected to add the discussed rules to you existing rule set where you think they are placed best. If you already have connection tracking in place, please skip the next rule. Otherwise just add the following rules to the INPUT and FORWARD chains at a very early stage. We have to allow incoming Wireguard packets, remember port 500? On a side note, if TCP port 53 sounds odd to you, it is well inside the bounds of specification. It wasn’t used widely during the legacy IP era and before DNSSEC became (somewhat) popular. To make life a bit easier, especially when debugging, we allow forwarding of packets that stay in the tunnel (if they hit the VPN server at all). Finally we want to allow forwarding of packets from the private wifi to the Internet. That’s it from filtering for now. The private router provides the private wifi and acts as the client side of the tunnel. I chose a RaspberryPi 3 as hardware platform for the private router, because it has a built-in wifi chip. Other platforms work well, too. I had this setup working on much smaller devices, too, e.g. an OpenWRT-capable router of the size of an USB thumb drive. Again, consider adding a line reading wireguard to /etc/modules. The ListenPort directive has a sometimes misleading name. Wireguard allows configurations that mock the more common client server model. In that case, ListenPort on the client becomes the source port of outgoing packets. Technically, the Wireguard module is also listening on this port, but let’s ignore this fact for the moment. In our case ListenPort will become the outgoing port and our filter rules will prevent any incoming packets that are not covered by connection tracking. The directive Endpoint expects the hostname of the VPN server followed by a colon and the port number. Since we want to receive packets from the Internet through the tunnel, we set AllowedIPs to ::/0. The RapsberryPi has built-in wifi that is compatible with hostapd, we can run a software access point on it. Hooray! This configuration just works and advertises reasonable values, although there is some room for improvements. You can play around with MaxRtrAdvInterval to directly save airtime or AdvPreferredLifetime and AdvRDNSSLifetime to indirectly save airtime by influencing client behavior. Our Wireguard tunnel has a MTU of 1423 octets, and since we are going to push almost everything from the private wifi through the tunnel, we should advertise this limitation. This is why I put in the AdvLinkMTU option. Please note that we already advertise the resolving DNS server here, which we will install and configure in the next step. The most important part is everything below forward-zone. The dot means all zones and forward-addr is the upstream DNS server to which we forward requests to. Make sure it is one of the listening addresses from the VPN server’s unbound.conf file. 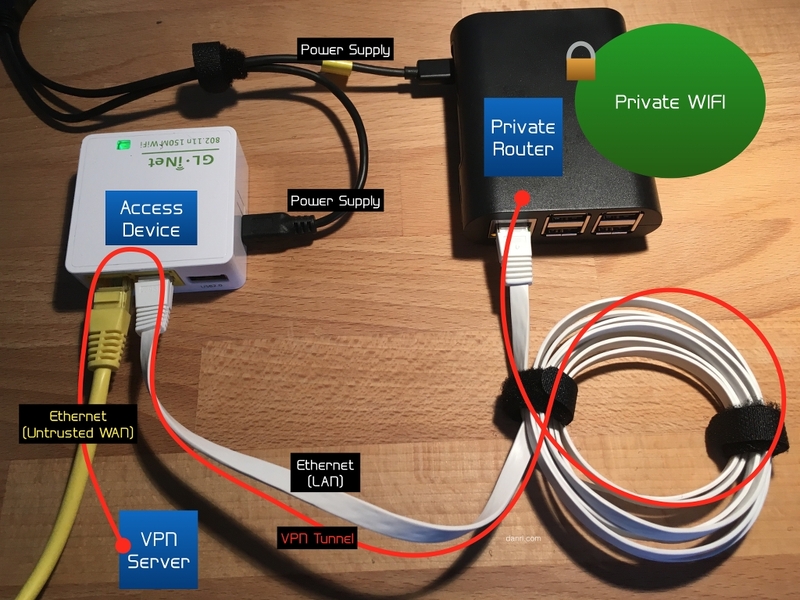 Routing on the private router is slightly more complicated than on the VPN server. We have to use policy routing to make sure a packet never leaves our trusted networks, which are the tunnel and the private wifi. 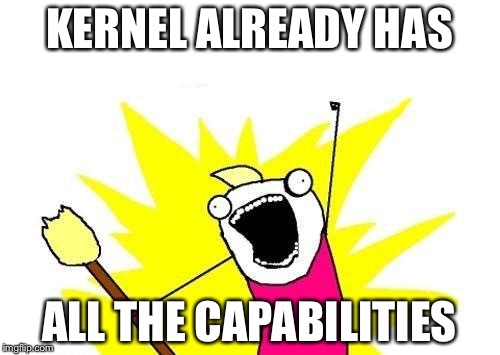 Even if a better route exists, the kernel must not forward any packet from a trusted network to an untrusted one. This ensures the custom routing table will be created after the next reboot. We want the custom table to be flushed before the VPN tunnel comes up, so that we start with a clean table every time the VPN flaps (if it flaps at all). We want the default route to point to the VPN server’s wg0 interface. This is the server’s in-tunnel address if you will. We want the interface route (on-link prefix) of interface wlan0 to be present in the table, so that local packets do not get routed away. Yes, sounds strange, but that does happen if the interface route is missing. Policy routing and custom routing tables are tricky sometimes. We want to force every packet that wants to leave the private wifi to use our custom routing table. Here is where policy routing jumps in. Again, I assume we have a decent basic filtering set up. The following rules allow clients on the wifi to access the caching DNS forwarder. Since DNS queries and responses can be quite large these days, we also have to consider that some clients may ask using TCP. It’s simple, just connect your access device, e.g. the suggested Android smartphone, to the private router and start enjoying your encrypted wifi with secured Internet access. A longer version is available, too. To access the legacy Internet one could set up NAT64 (preferred) or run the whole setup dual-stacked. If you like to run a dual stack network, you just have to repeat the above steps involving IP addresses using legacy IP addresses and legacy networks instead. It is pretty straightforward, except one caveat: ICMPv4 path MTU discovery in this VPN setup is not working well with some legacy-only servers and websites (they still exist!). Some packets may be dropped just because of their size, with no way for a device connected to the private wifi to determine the right packet size. A quick and dirty fix is to mangle legacy TCP connections and force a lower maximum segment size (MSS) on them. Here is my private router in action at the Detroit Metropolitan Airport, providing secure wifi for my gadgets while waiting for my flight to DEFCON. I receive quite a few emails on the topics of OpenWrt and WireGuard every week. Unfortunately, I do not have the time to answer all of them individually. 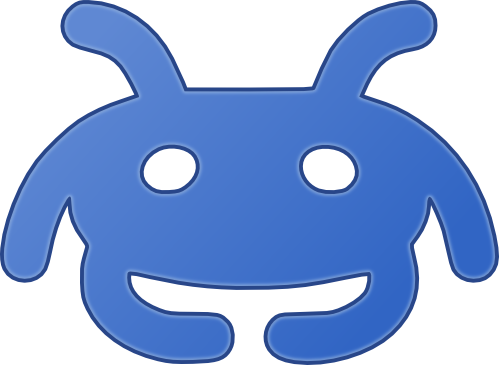 So I kindly ask you to direct questions regarding WireGuard and OpenWrt/LEDE to the OpenWrt Forums or to the WireGuard Mailing List. There the questions will be exposed to a wider audience and may additionally help other people facing the same challenges. Thank you! Like to comment? Please drop me a line!